The "Vegetarian" Fresh Juice Bar located in the New Shinbashi building 1st floor, has been in business for 40 years. They have various types of juice, but everything is in Japanese, so you would be well served with some ability in it, or to bring a friend to help. 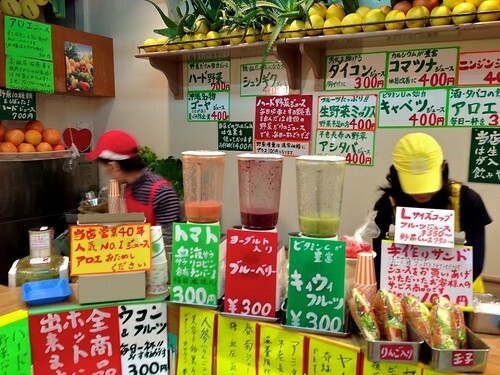 Prices are reasonable at 300 to 700 JPY, with egg or veg-fruit sandwiches available cheaply for juice customers. … and various others. Most of the juices have a bit of fruit in them, and they seem to be putting red grapefruit in with the parsley and kale juice. The "hard" yasai is 7 types of veg mixed together, and is veg only, and "harder to drink" according to the hardworking ladies of Vegetarian. Hours - 7:30AM to 8:30PM M-F, 9:30AM to 19:00PM Sat. Please see my site http://rick.cogley.info for this blog and other information. Thanks! ***=>> Please see my site at http://rick.cogley.info, as that is where I am blogging these days. <<=*** James Rickard Cogley (http://rick.cogley.info) is based in Tokyo Japan, and has been working in the consulting and support industry since 1990. He specializes in bilingual (Japanese - English) consulting and project management, and his company eSolia (http://www.esolia.com) is a privately-held Japanese KK focused on the same.